Nearly everyone can recognize a butterfly fluttering past on a summer's day, flying from flower to flower in its quest for nectar. These scaled-wing insects are known worldwide, although many are suffering the effects of habitat destruction and loss. Common butterfly habitats are everywhere, including your backyard and anywhere else that supports a small population of their favorite plants. New species of butterflies still are being discovered, but scientists estimate the number of species worldwide to be between 12,000 and 15,000. Butterflies and Moths of North America estimates approximately 750 species exist in the United States and Canada. In comparison, the butterflies' close relatives, moths, number approximately 150,000 to 250,000 worldwide, and around 11,000 in the United States and Canada. Butterflies live worldwide except the arctic. Nearly anywhere with nectar-producing flowers will host butterflies. Some species live in the deserts and feed upon the succulent plants that grow in the harsh conditions. Empress leillia (Asterocampa leillia) and elada checkerspot (Texola elada) are two desert-dwelling species. 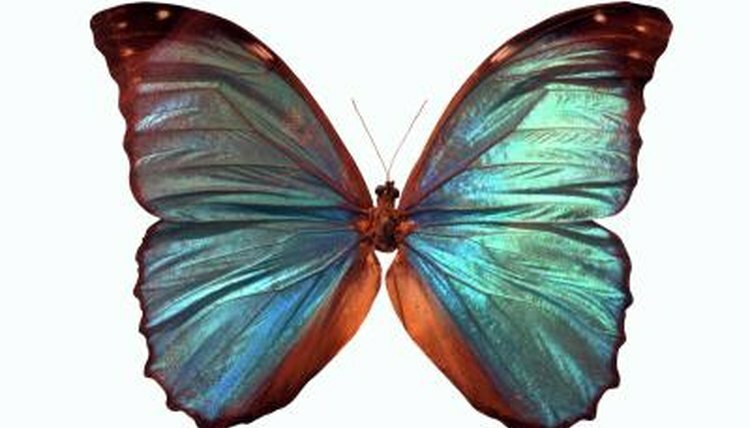 Others, such as the blue morphos (Morpho peleides), live in dense rainforests, feeding off the flowering plants and trees. Still others inhabit meadows and temperate prairies, fluttering from wildflower to wildflower. The largest factor playing into butterfly habitat is a species' food source. Butterflies, like many other creatures, are host-specific, meaning they feed on one or a few specific plants. Adults often will flutter about to many plants, but the larvae are much more specific. The monarch butterfly (Danaus plexippus), for example, feeds exclusively on milkweed (Asclepias spp.). The similarly colored viceroy (Basilarchia archippus) prefers willows (Salix spp.) and cottonwood (Populus spp.). Common hairstreaks (Strymon melinus) have a few favorite hosts, including false indigo (Amorpha spp. ), hops (Humulus spp.) and hibiscus (Hibiscus spp.). Climate is another major factor in butterfly habitat. Some species may remain in an area throughout their life, but others are migratory. Some southern species migrate north during the spring; these include painted lady (Vanessa cardui), a few skippers (Hesperiidae family), common buckeye (Junonia coenia) and red admiral (Vanessa atalanta). Other species, however, migrate during the fall, including monarchs, question marks (Polygonia interrogationis), queens (Danaus gilippus) and mourning cloaks (Nymphalis antiopa). Although migration is studied, particularly in monarchs, there is much to be learned about the migratory patterns. The Children's Butterfly Site: How Many Kinds of Butterflies and Moths Exist?